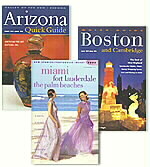 Guest Informant, the country's leading publisher of visitor's guides, distributes hardcover books and digest-style QuickGuides in over 2,000 hotels across the United States. No stranger to content reuse, Guest Informant staffers manually cut and paste hundreds of listings and spotlight articles to multiple formats. To meet the ever-increasing demand for accurate and immediate travel information, the company had to find a way to reuse printed content across publications as well as on cityspin.com, the corporate website. DPCI developed an application for Guest informant staff to store and reuse content independent of medium. The new Guest Informant content management system offers a database-driven production and editorial system for staff throughout the country to create, manage, and deliver travel information and imagery to any book format as well as dynamically to cityspin.com. With the DPCI-built application, Guest Informant not only benefits from a collaborative workflow system for writers, editors, and graphic artists, but the company now serves customers with the most up-to-date and accurate travel information anywhere to be found in the industry. DPCI: We help our customers harness the power of their content.